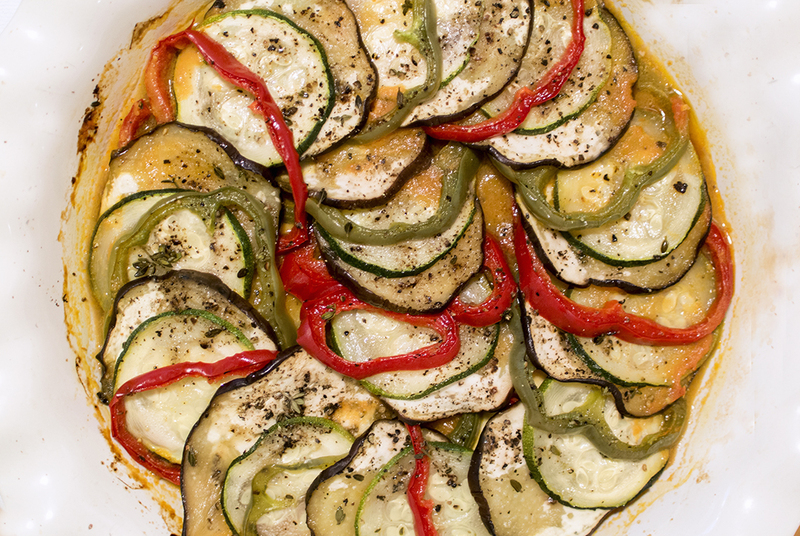 Continuing with our French night dishes, I decided that it would be fun to try something as iconic as ratatouille. It was hard not to love the movie and Remy’s final pièce de résistance to win over the critic. It turns out that renowned chef Thomas Keller served as a consultant on the movie and designed the final dish based on confit byaldi. Traditional ratatouille often doesn’t involve the beautiful layered presentation, but I really loved the aesthetic of it, so I thought we’d give it a try. Preheat oven to 375 F. In a pot, add olive oil and put in tomato halves over medium-high heat. Let simmer until the tomatoes are broken down (can speed along the process by mashing them with a spoon). Season with salt and pepper. With an immersion blender, purée the tomatoes. Stir in garlic and onion. Pour tomato puree mixture into bottom of an oval baking dish, approximately 10 inches across the long way. Trim the ends off the eggplant and zucchini. Trim the ends off the bell pepper and remove the core, leaving the edges intact. Cut the eggplant, zucchini and bell peppers into very thin slices, approximately 1/16-inch thick (if you have a mandoline, that would be ideal). Atop the tomato sauce, arrange slices of alternating vegetables concentrically from the outer edge to the inside of the baking dish, overlapping them so just sliver of each is showing. Drizzle the remaining olive oil over the vegetables and season them generously with salt and pepper. Sprinkle the fresh thyme over the dish. Cover dish with a piece of parchment paper cut to fit inside. Bake for approximately 45 to 55 minutes, until vegetables have released their liquid and are clearly cooked, but with some structure left so they are not totally limp. Don’t let the edges brown, and the tomato sauce should be bubbling up around them. A few notes on preparation: The eggplant we got was fairly large (a smaller, Italian eggplant would’ve probably been easier), so we used the smaller end first and cut it in half and used half slices. I actually lay down a layer of large half-slices of eggplant over the tomato to form a base for the smaller veggies, so they wouldn’t sink in and get too messy. We don’t have a casserole dish, so we just used a deep dish pie plate. The results were a success! Rich and round (or as David punned, “many layered) in flavour, it made a lovely first course for a French meal. I could see this working well as a side dish as well for a strong meat dish. The original recipe noted that it could work well with a dollop of goat cheese atop each serving, which I think we’ll have to try at some point.